Looking for faster way for configuring or programming Altera FPGAs? Use SLS USB BitJet - A High Speed download cable which can program, configure or debug Altera FPGA based hardware systems at much Faster Speed. The USB BitJet download cable interfaces a USB 2.0 port on a host computer to an Altera FPGA mounted on a printed circuit board. The cable sends configuration or programming data from the PC to a standard 10-pin JTAG or Active Serial header connected to Altera FPGA. 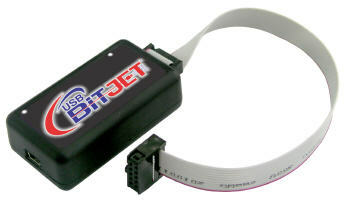 You can use the USB BitJet download cable to iteratively download configuration or programming data to a system during prototyping or production.